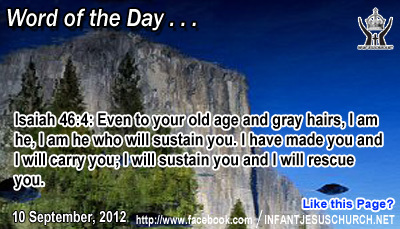 Isaiah 46:4: Even to your old age and gray hairs, I am he, I am he who will sustain you. I have made you and I will carry you; I will sustain you and I will rescue you. Heavenly Father, thank you, for promising to never forget me. Because of your faithfulness to your children of old, we know we can trust your promise to never leave us alone. We trust that no matter where we are or where we go, you will be with us. In Infant Jesus' name we offer our heartfelt thanks. Amen. We commemorate Sunday as Lord’s Day it to celebrate God's work of redemption in Jesus Christ and the new work of creation gifted through Christ's death and resurrection. God's action is a model for each one. If God "rested and was rejuvenated" on the seventh day, we, too, ought to "rest" and let others, especially the poor, "be invigorated". About "our sabbath rest" is a way of expressing respect to God for all that he has done for us. Such "rest" though does not exempt us from our love for our neighbor. If we truthfully love the Lord above all else, then the love of God will flood to love of neighbor as well. Saint Augustene said: "The charity of truth seeks holy relaxation; the necessity of charity accepts just work." How can we make Sunday a day holy to the Lord? 1st of all by abstaining from unnecessary work and from activities that hinder the devotion we owe to God. We can also do works of mercy, such as humble service of the sick, the sick, and the elderly. And we ought to seek suitable relaxation of mind and body as well. The joy of the Lord's Day is a great gift to revive and strengthen us in our love of God and of neighbor. Do we know the joy of the Lord and do we find rest and stimulant in celebrating the Lord's Day?